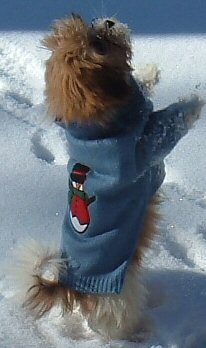 Welcome to the portion of this website dedicated to our Lhasa Apsos and Lhasa-Poos. We hope that it will be enjoyable, helpful and informative for our visitors. If you are interested in purchasing any of the puppies being offered for sale, please use the link below to view the available puppies. Years ago when I was a young teenager, my friend who lived next door received a Lhasa Apso puppy as a gift from her father. Her father, who was a foreign diplomat and world traveler, received the puppy as a gift during a trip to Tibet. 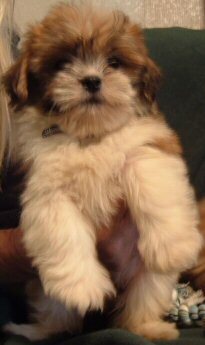 This was the first time any of us had seen a Lhasa Apso, and it was love at first sight for us all. The puppy proved to be a highly versatile pet. It was very loving and affectionate as well as playful and energetic. It was keenly intuitive and intelligent, and extremely loyal and protective of its new family. I knew that one day I would have a Lhasa Apso. Once my husband and I retired and were able to stay home to care for a canine companion, we began searching for just the right one. Having been a large breed breeder for many years, he was most partial to the English Bulldog. I on the other hand shuddered at the thought of having a pet with a chronic slobber problem. The breed closest to my heart has always been the Golden Retriever. However, there were two very important factors we had to consider in our choice for a pet dog. We had a well-established feline household, and we needed a breed of dog which travelled easily. In researching the various small canine breeds, the Lhasa Apso seemed to have most of the personality traits and characteristics we wanted in a pet and companion. But most intriguing in our search for information was discovering the trend in designer hybrid dog breeding. We learned that Lhasa-Poos, produced by breeding a purebred Lhasa Apso with a purebred Poodle (preferably a Toy), was a highly desirable recognized designer hybrid breed of dog, possessing all of the qualities we wanted. The problem was locating a Lhasa-Poo breeder within fairly close proximity of our home. 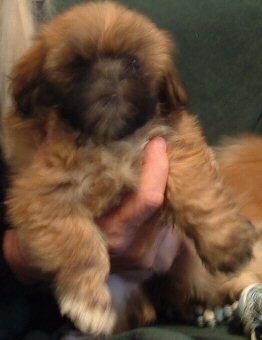 In October 2006 we located an excellent Lhasa Apso breeder about 45 miles away. After being offered an excellent price for the purchase of two of her puppies, we bought two sister litter-mates. We gave them Tibetan names in honor of their native heritage, and registered them with the American Canine Association (ACA), where they had been pre-registered. The photo above were taken soon after we got them, when they were 2 months old. They were and still are inseparable, and we believe that they can actually read each other's thoughts. Although there are distinct differences in their individual personalities, they both are extraordinarily affectionate and loving, and are in their true element when lounging on the couch with their humans. If you were to look up "lap dog" in the dictionary, their pictures would be there with the definition. Between the two Lhasas, Abi seems to have the intellectual edge over Manda. She's always the first to respond when visitors arrive on the property, and when one of the cats decides it wants to come into the house. She's the most passionate about protecting her domain (her house, yard, humans, cats, sister, neices and nephews). She has a tendency to show jealousy when she feels that another pet is being shown more attention. She has a higher energy level than Manda, embarking on dead-heat runs through the back yard all by herself. Abi loves to cuddle with one of "her" cats, while Manda couldn't care less. Abi clearly has the more exuberant personality, while Manda is basically much more laid back in nature. The Winter snow arrived when Abi and Manda were 3 months old. 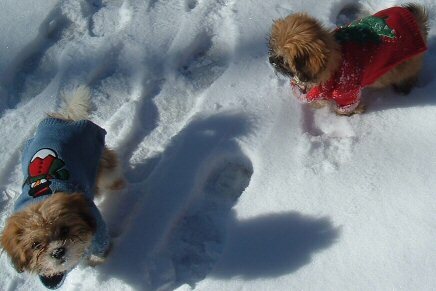 They loved playing in the snow, and it was about this time that they learned how to sit up for treats. At a year old, Manda (left) and Abi have clearly lost their puppy fur, and the beautiful red coloring went with it. True to form, they have taken on the coloring of their father. 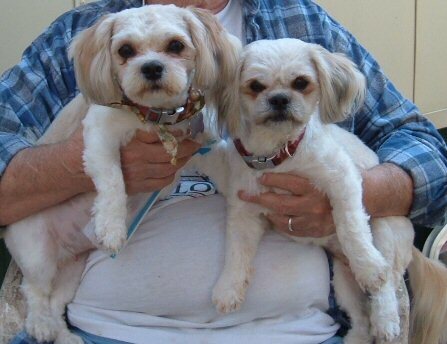 Manda's teddy-bear like facial features were inherited from their mother, while Abi's more typically Lhasa facial features, including the underbite, were inherited from their father. Since we live in the country amongst trees and dirt and gravel roads, we keep our Lhasas clipped short, rather than allow their hair to grow to the length of the breed standard. We decided to try to breed one of our Lhasas to a Poodle to obtain the Lhasa-Poo we had wanted in the beginning, and we determined that Manda would be the best candidate. 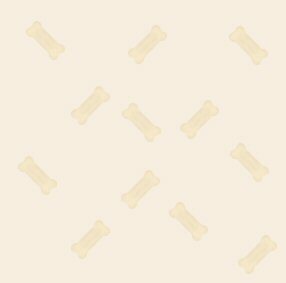 In late September 2007 we contacted a breeder in a neighboring community who was recommended by our vet, who specialized in small breed canines. She had three excellent Toy Poodle studs to choose from, and we let Manda decide which one appealed to her the most. Luckily, she picked out the one I preferred, a little 7-pound apricot. 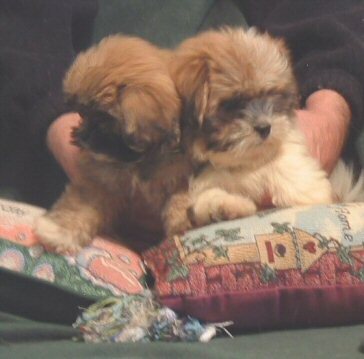 Breeding was highly successful, and on November 23, 2007, the Saturday after Thanksgiving, Manda blessed us with five perfect little Lhasa-Poos. To see the results, please click on the link below.